The trendy Witte de Withstraat is a popular place to spend free time. It has various shops and a wide range of pubs, bars and restaurants for everyone to enjoy. The 350-meter-long street is located on the south side of the city centre next to the Museumpark and parallel to the arterial Westblaak. In contrast to the cosy layout of the street, it is neither the domain of pedestrians nor that of cyclists during the day. Delivery trucks obstruct and block the traffic in the street here as they supply the businesses. Despite the presence of plenty parking spaces, there is only one loading and unloading spot; right in front of the local supermarket. The elegance of the Witte de Withstraat is unique for Rotterdam. The combination of preserved pre-war buildings, various art galleries and trendy nightlife give the narrow street an extraordinary sense of character. 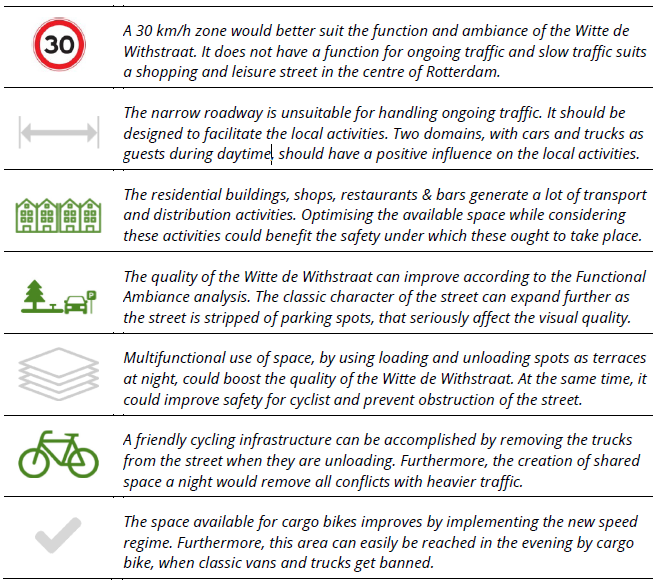 Given the current use and width of the Witte de Withstraat, only a design with two domains is possible. The footpath is already physically separated from the roadway. 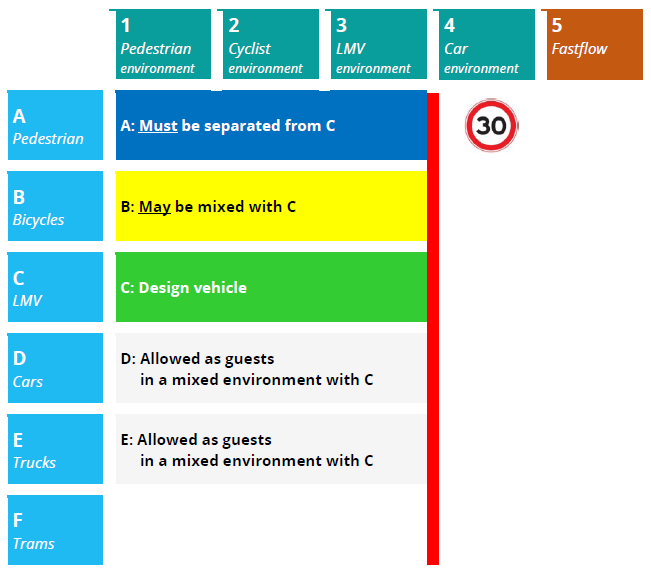 The space on the road is divided between cyclists and light motor vehicles, the latter category being the norm for the design. Cars and trucks are allowed as guests. Decreasing the speed regime to 30 km/h fits both the ambiance and the function of the road much better. People on the terraces are literally inches away from the road. In addition, the roadway is used for loading and unloading. In a tight street like the Witte de Withstraat, it is, more than, for example, the West Kruiskade, desired that the traffic is driving slower for safety reasons. 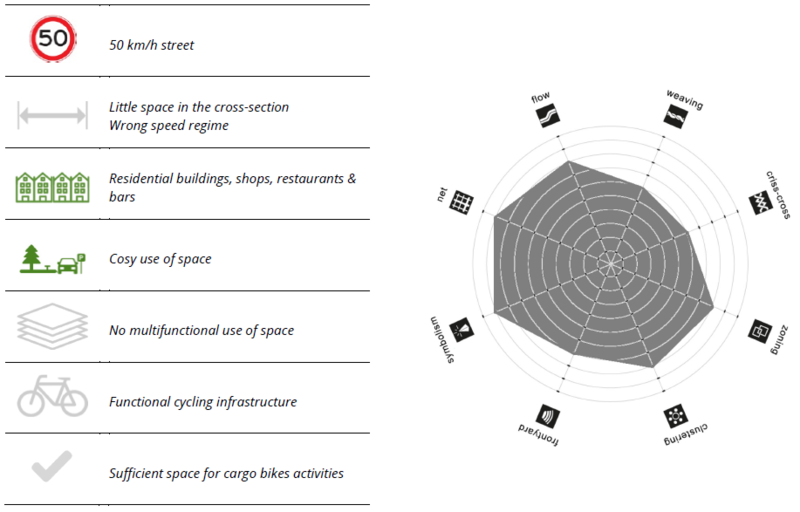 It appears, from the scoring of the quality aspects of Functional Ambiance, that the quality of several aspects in the Witte de Withstraat is quite high. All the individual aspects appear to have sufficient quality, but there is also some room for improvement. In the Witte de Withstraat there are too few loading and unloading spots. In addition, the ever-present parked cars destroy the beauty, elegance and atmosphere of the street. But this is changing. Terraces are slowly taking over the parking places. Furthermore, bicycle parking spaces are slowly emerging. Finally, it is time to give the street back to the community by using the street for supplying during daytime and turning it into a city lounge for pedestrians and cyclists at night time.